This blog has been active for one year! A few posts about opening lines have been coming my way, that I happened on in Facebook from someone I don’t know personally but somehow ended up being a Facebook friend of mine. Can’t remember how that happened. The best opening lines were determined, from all genres of books, the idea being that you should hook the reader on the first line, go on to further hook with the first paragraph, first page, first chapter. And no backstory until at least the second chapter, after you’ve sufficiently hooked the reader. 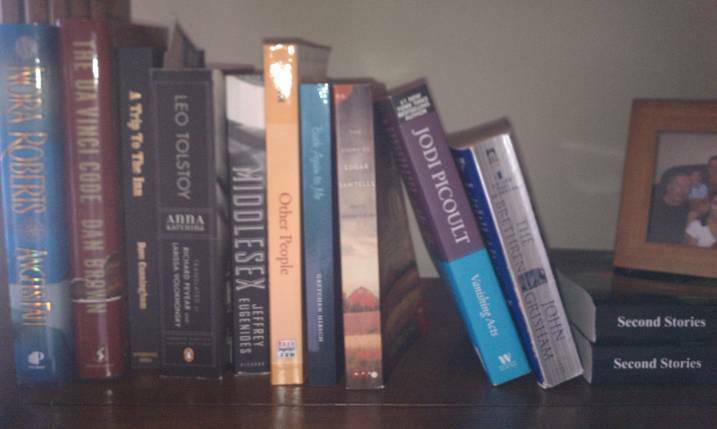 I thought I’d do the opposite and take ten books from my bookshelf, all of which I have read, and examine their first lines and dissect them, whether they are bad or good and issue them a thumbs up or a thumbs down. 1. Renowned curator Jacques Sauniere staggered through the vaulted archway of the museum’s Grand Gallery. This is pretty good, I think. There is enough detail that I am intrigued. I know that Sauniere is a curator, and the fact that he is “renowned” probably puts him at middle age or beyond. The fact that he “staggered” is a curiosity, and it puts me in a museum, probably a section of which is devoted to fine arts, (the “Grand” Gallery). I am most interested in why he staggered. Something has happened to this old guy, let’s find out what. Thumbs up on this one, although I found the rest of the book tedious. 2. The day Shelley told me she was pregnant, I laughed. I think laughter as a response to someone announcing a pregnancy might not be appropriate, so I would like to know why that happened. But other than that, I’m not sure I liked the opening line. It sounded flippant. This book was self-published by a woman who gave an interesting time management talk to aspiring writers. As part of the deal, she wanted to read a portion of her manuscript to the audience and get their feedback. I liked what she wrote, so I bought her book. It was good, I’d say it was really good women’s fiction. The author is an accomplished writer of non-fiction and this was her first attempt at fiction. I thought she did a really good job of it, but her publisher wanted nothing to do with fiction, which is why she self-published. Liked the book, not the opening line. Thumbs down. 3. The day was too beautiful to take a cab. This book was written by the son of a friend of mine. I believe it was his first, and there were parts of it that I liked a lot and found very thought provoking. Most of the characters were evil; there were almost no good characters in the story, they were all out to get each other. Which is fine, I don’t believe you have to identify with, or like, characters, but not everyone agrees with that by any means. The premise of the book was excellent, in the way of the movie, Fargo, where one bad event happens and it gets covered up, and more characters get involved, so the cover ups go on and escalate until it’s a real mess of a situation. But the opening line didn’t do it for me. Thumbs down. 4. Reece Gilmore smoked through the tough knuckles of Angel’s Fist in an overheating Chevy Cavalier. This tome was left behind by someone, and wouldn’t have ended up on my bookshelf otherwise. But in the spirit of diverse genres, I read it. I wasn’t disappointed, in that, I got just what I expected. I did like part of it, but mostly it’s formulaic in content. The opening line tells me nothing much except she is probably in some sort of financial trouble, but by the sound of her name, I would guess it is a temporary situation. This author is a bazillionaire, has written hundreds of books and has fans that will probably do themselves in if anything ever happens to Ms. Roberts. I thought “smoked through” and “tough knuckles” were iffy in their credibility, but I guess this author can now say whatever she wants and no one will dare to suggest she do it otherwise. Luckily she won’t happen upon this post, so I can be safe in saying, thumbs down. 5. I was six years old the first time I disappeared. Good. This is a great hook, at least for me. I have no idea what is going on here, but that line seems poetic to me. A lot of Ms. Picoult’s sentences are poetic, and I always start one of her novels so hooked I can’t put the thing down. Unfortunately it doesn’t carry me to the end. She does a great job of hooking, but not a great job of sustaining. By the end of the book, I didn’t really care much what happened to the characters and there were events included that I thought should be cut, that they did very little to add to the story, if anything. But the first sentence is definitely a thumbs up. 6. For the weekly docket the court jester wore his standard garb of well-used and deeply faded maroon pajamas and lavender terry-cloth shower shoes with no socks. Ah, John Grisham. His books are well-written, exciting, entertaining. He is also a bazillionaire. And getting what you expected, in this case, is a good thing. Not literary by any means, kind of like going to a movie of this same genre, it’s fun while you’re there but you don’t take anything away from it other than the fact that you had two very pleasant hours watching it and the popcorn was delicious. I can’t say I know anything about what the book will be about with the first sentence but it seems like he spent a lot of time on it, and while it piques my curiosity, I can’t say it hooks me. Thumbs down. 7. When I telephoned Thomassy that morning in March of 1974 and asked him to lunch, I counseled myself to muster a casual voice. Mr. Stein writes fiction and also how-to-write books for amateur authors. In On Writing, he says that he wrote this novel using first person POV. That’s not unusual except that he skipped from person to person and there were several characters, each with a chapter headed with his or her name so you knew whose head you’d be inside at any particular time. He said this was hard to do, and wouldn’t recommend it to us newbies. I was curious and read it. I liked it, and I liked the first line, which tells me in what time frame the story takes place, and that the caller is very anxious, or nervous, or upset and wills himself to be calm when speaking to Thomassy. I liked it, thumbs up. 8. I was born twice: first, as a baby girl, on a remarkably smogless Detroit day in January of 1960; and then again, as a teenage boy, in an emergency room near Petoskey, Michigan, in August of 1974. Apart from the punctuation, what’s not to like about this? It sets the time and place and the idea of being born twice – what’s that all about? I want to know, and maybe I have an inkling, but it sounds like it will be an interesting unraveling of the facts. And it was. This was an Oprah Pick, and I like this first line and give it the thumbs up but could do without the colons and semis. 9. All happy families are alike; each unhappy family is unhappy in its own way. This is on everyone’s list as one of the greatest first lines of all time. It is one of the best books ever written about nineteenth-century Russia, and social scandal. Men are allowed a certain freedom to dally, but not so with women. The men might have to deal with irate wives. The women throw themselves under trains. The beauty of this book is the translation. (Richard Pevear and Larissa Volokhonsky). I have seen other versions that do not compare to this one. It made me wonder, is it the writing that is wonderful, or the translation? Guess we won’t know for sure, but this first line is naturally a thumbs up. 10. After dark the rain began to fall again, but he had already made up his mind to go and anyway it had been raining for weeks. I did like this first line but I’m not sure if I can explain why I do. It’s conversational, as if the author is about to tell me a story. And I do want to know where he is going. The style makes me think this book will be beautifully written in an understated way. Of course I don’t know that to be true after reading just this first line, but it did turn out to be true. Thumbs up. This entry was posted in Book Reviews, Writing and tagged baby boomer fiction, boomer-lit, opening lines, setting the hook, women's fiction by Lynn Schneider. Bookmark the permalink. That was fun. I used to teach a writing lesson analyzing first lines. It really helped the students revise their work. Have you thought of reviewing books? You’re good! Thanks Nancy! It’s made me think I need to revise my own first line. Great post. I enjoyed reading your blog today. If you love to write we would love for you to join us!